﻿ 2 Corinthians 13:14 The grace of the Lord Jesus Christ, and the love of God, and the fellowship of the Holy Spirit, be with you all. The grace of the Lord Jesus Christ, and the love of God, and the fellowship of the Holy Spirit, is with all of you. Truly. the favour of the Lord Jesus Christ, and the love of God, and the communication of the Holy Spirit, be with you all. amen. The blessing of the Lord Jesus Christ, the love of God and the participation in the holy Spirit be with you all. The grace of our Lord Jesus Christ, and the love of God, and the communion of the Holy Spirit with you all. Amen. 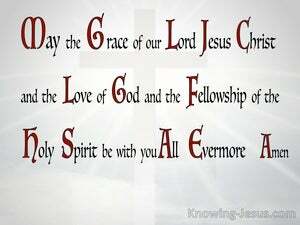 May the grace of the Lord Jesus Christ, and the love of God, and the fellowship of the Holy Spirit be with you all. Amen. 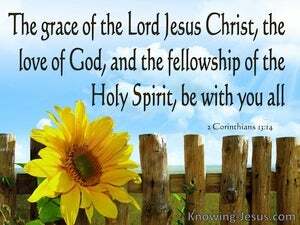 The grace of our Lord Jesus Christ, and the love of God, and the fellowship of the Holy Spirit be with you all. 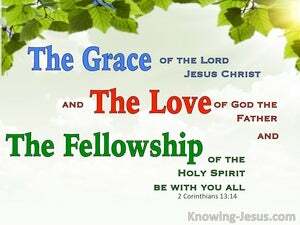 The grace of the Lord Jesus Christ, the love of God, and the fellowship of the Holy Spirit, be with you all. The grace of the Lord Jesus Christ, and the love of God, and the partaking of the Holy Spirit, be with you all. The favour of our Lord Jesus Christ, and the love of God, and the fellowship of the Holy Spirit, be with you all. May the blessing of the Lord Jesus Christ, and the love of God, and the communion with the Holy Spirit, be with you all. The grace of the Lord Jesus Christ, and the love of God, and the communion of the Holy Spirit, be with you all. Amen. May the grace of the Lord Jesus Christ, the love of God, and the fellowship of the Holy Spirit, be with you all. The spiritual blessing of the Lord Jesus Christ, the love of God, and the common sharing of the Holy Spirit be with you all. The grace of our Lord Jesus Christ, and the love of God, and the communion of the Holy Spirit, be with you all. and the love of God, and the communication of the Holy Spirit be with you all. Amen. the grace of the Lord Jesus Christ, and the love of God, and the fellowship of the Holy Spirit, is with you all! Amen. Otherwise if you bless in the spirit only, how will the one who fills the place of the ungifted say the "Amen" at your giving of thanks, since he does not know what you are saying?